An idol pop singer whose song lyrics are often very dirty or controversial. She started her career singing on the sides of streets. This was when Shinpachi met her and has followed her ever since, being captain of her fan club. Her talent was recognized by Bansai Kawakami (under his producer alias "Tsunpo"), and she has since gained popularity. Her mother manages her, and her father is currently serving time in prison. When she was younger, her father made a bet with her, saying that if she became famous, he would bring a number of roses to her first concert. He broke out of prison specially for the occasion, and although he couldn't give her the roses, he gave her a single flower. He donned a paper bag over his head, so he wouldn't trouble her with his presence, yet she knew it was him, and thanked him with tears in her eyes. 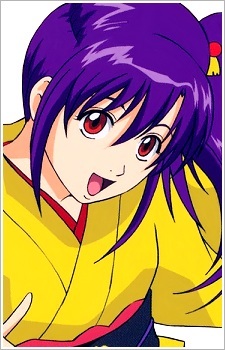 She had previously dated a man named Goemon, who worked in the entertainment industry alongside her. Tsu admired him greatly, as "he was the only person who was nice to her", but it was revealed that Goemon truly thought nothing of her, and even went as far as to send her threatening anonymous letters advising her to finish with him. She became part of the Shinsengumi for a day, to raise morale.